Have you wanted to get started in the fun and exciting hobby of bird watching but were not sure how to begin? We are here to help you. We will be looking for winter residents as well as our winter visitors, such as Juncos, Tree sparrows, Great Black gulls and all the glorious ducks coming into their breeding plumage. Wild Birds Unlimited has one more free hike planned, November 25, 2018. 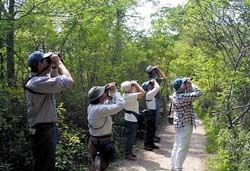 We will be birding one of the local birding hot spots, Humber Bay East. The staff of Wild Birds Unlimited will be leading the hikes. Kyle and Barb will be your hike leaders. Please call or email the store and sign up for the hike/hikes date/s you wish to attend. Please provide the number of attendees. Hikes will run until 11 am. Hikes may be cancelled due to inclement weather. Call the store Saturday during working hours (10 am - 5 pm) for a hike update.